Include your calf & ankle size on all wrestling boot orders on our payment forms. More Info click here >> Also send us a separate email with your boot colour preference, contact Tel number and again your calf & ankle size so we are sure. 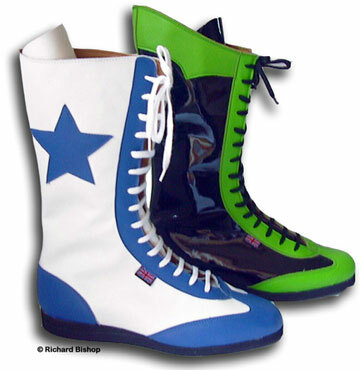 Example image above shows two high leg lined white leather and double colour patent wrestler boots finished with extras. This image is an illustation some of the colours avialable, you may choose your own colours, please email us with your request. We can design to your requirements email the specialists in custom made wrestling boots. Custom ringside promotion wrestlers begin life as one of our popular classic range either patent or natural hyde leather and fully lined. .Size range 5-12 although we can manufacture up to size 16 please ring or email for a quote. Basic cost is £168 For additional work email before buying . For today's wrestling competitor within the WWF ring individuality is of high preference which is why here at RB Footwear we recognized custom built wrestling boots as a serious objective throughout our design department and quality are fundamental in the formulation of our wrestling boots. Under normal circumstances our customers have a fixed idea as to how they wish their end product to look however the design department will always be happy to help in assistance of end product design for you. Give the department your wrestling name style or trademark and we could do the work for you. Contact click here or ring and ask to speak to Richard Bishop himself. The boots here in the custom design range are not limited to the selection show and are displayed to give you some idea of what you may well be looking for. Remember Quality is what we have built our business on since as far back as 1969 and you have our word that your hand made boots will be the very best in the industry. We ship to UK, USA & Europe. Postage remains independent of above cost.